West View is a Hotel with 3 Star facilities offering the best of accommodation. This whole bed room giving a grate contemperary look. This is made of solid teak wood with polish finishing. In head rest of bed upholstery is used with leather finishing. The standard room category of this hotel. This room comes with standard twin bed sharing option with modern amenities & facilities like – Wi-Fi, Tea/ Coffee makers in the room which makes your stay cozy & comfortable. All the facilities at Hotel Anand Retreat has a great view of Metro and lash green park with natural light available in all the rooms. - Accommodation in a Valley Facing Room. Ultimate in luxury, these rooms let you experience royalty. 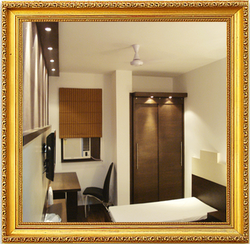 These rooms have been designed to accommodate all the needs of those who cannot compromise with luxurious lifestyle. Super deluxe rooms have been carefully decorated to provide you an unmatched ambience. These rooms are spacious enough for an average family to stay and are equipped with the cream of facilities and amenities. Amarjeet Power Tech Pvt Ltd .
Read More Business Travel Made Easy Stay connected wherever, whenever. Leave the rest to us. Read More Romance Create unforgettable moments with someone special. The super Deluxe rooms are well furnished with soft colored walls and elegant decor. The area of 200 sq. ft. is equipped with King Bed or Twin Beds for double occupancy, a working table and chairs, a cupboard/cabinet. An attached bathroom is well equipped with amenities and is maintained with hot and cold water round the clock. Best rates for all 4 star and 5 Star hotel in Delhi and across India.